cookbook. Who knows how that one has slipped by me... Anyway, I don't think it's necessary to own the original Momofuku cookbook to enjoy this one. This cookbook had such a cool vibe to it from the funky photos to the party-ready recipes. Many of the recipes seem simple to prepare and remind me of the comfort and party food that I've enjoyed throughout my life. What would a gathering be without cocktail meatballs? I can't wait to prepare the chicken puffs for my next social event. Don't worry, cookie lovers! There are plenty of recipes to satisfy your sweet tooth. In addition to the classics, you'll find unique recipes such as Hijacked Biscoff Cookies, Ritz Cookies, and Salt-and-Pepper Cookies. Again, this is a cool cookbook to have if you want to find familiar recipes that have been kicked up a notch with a quirky ingredient here and there. I thoroughly enjoyed reading it and can't wait to try out these recipes on my family. 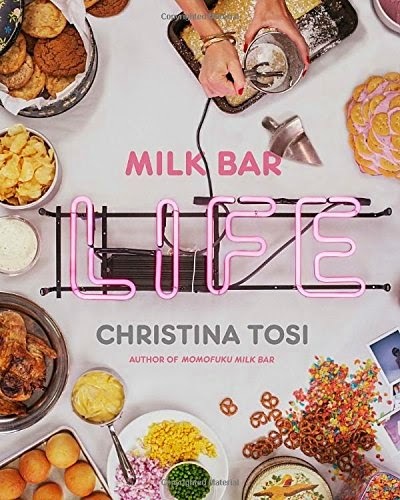 CHRISTINA TOSI is the chef, owner, and founder of Milk Bar, sister bakery of the Momofuku restaurant group, with locations in New York City, Toronto, and soon Washington, D.C. She is the 2012 recipient of the James Beard Rising Star Chef Award, a finalist for the 2014 James Beard Outstanding Pastry Chef Award, and a judge on Fox’s MasterChef and MasterChef Junior.